Remove hair without using a shaver. You may not like shavers, tweezers, waxing or sugaring which pull at your hair. You may also not like using chemicals, creams or lightening with bleach. Hair remover discs are an alternative option. The idea is to rub out the excess hair. You, very gently, brush these against your skin in a circular motion. Your light hair is broken up by the mildly abrasive surface. Darker hair can be smoothed down as it comes back. You also get a great facial scrub, with dead skin being buffed and cleared. If you have sensitive skin, unlike with other methods you are in control, and can lighten your touch. Some practice on their legs for a while, as the surface adapts to their skin, and they get used to using the discs before moving on to their face. If you are comparing, some other hair removing discs are like stick on sand paper pads rather than something which will last and fresh sheets can become hard to find. Two 6.5cm 2.5 in hair remover discs with easy to use handles are supplied. Maybe keep one in your bathroom and one for your handbag or car for emergencies. 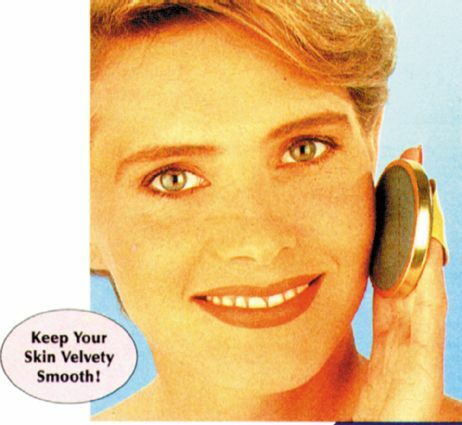 Hair Remover Discs text, images and video are copyright.